Lower, slower income tax refunds that have dragged on retail sales this year are disproportionately hurting upscale stores, since high-income shoppers are more likely to get an unexpected bill from the Internal Revenue Service under changes backed by President Trump and congressional Republicans. February revenue at U.S. retailers fell 0.2 percent from the month before to $506 billion, the Census Bureau said Monday, and merchants placed much of the blame on cold weather, stock market fluctuations, and shrinking refunds after a GOP-led tax overhaul that eliminated or cut many of the deductions once claimed by people earning $100,000 a year or more. Those changes, and Treasury Department efforts to buoy take-home pay through adjustments to withholding tables, left some taxpayers getting little to no money back from the IRS and often having to make surprise payments. 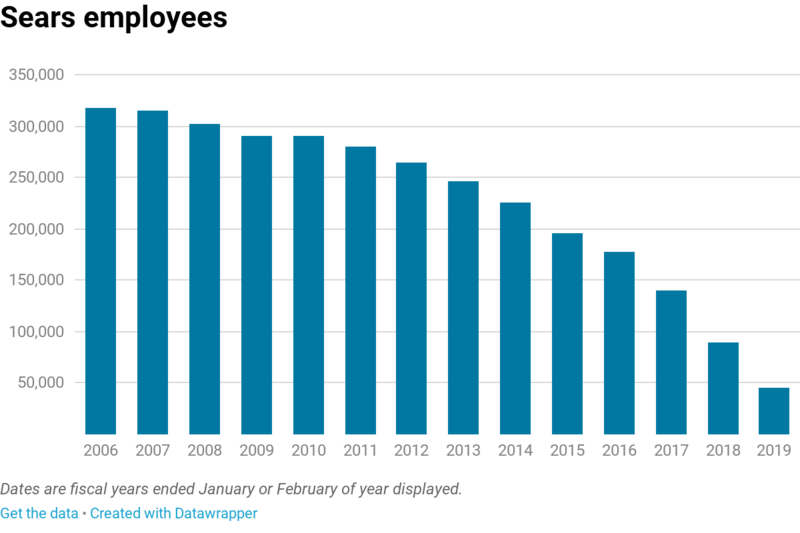 The total number of payouts issued so far this year is down 2.6 percent from the same period in 2018, according to IRS data, and the amount has dropped 2.9 percent to $191.9 billion. The refunds have already become a talking point in the 2020 presidential race, and a CNN poll last year showed the tax bill — which granted a large break to businesses — dragged on Republicans in the 2018 midterms when voters gave Democrats a majority in the House of Representatives. “We see the most risk to households in the upper-income demographics, particularly those that live on the coasts, as they likely get impacted” by limits on state and local tax deductions, said Michael Lasser, an analyst with Swiss lender UBS. That weighs on retailers such as Restoration Hardware and Williams-Sonoma, while leaving discount stores such as Walmart unfazed, he said. Conversely, a UBS team tracking the effects of refunds on retailers predicted married couples with two children earning less than $40,000 a year would be the biggest beneficiaries, with their refunds jumping to an average $2,300 from about $500. “This should be particularly beneficial to companies which are levered to the lower-income households,” UBS noted. Among them are Dollar Tree and Dollar General as well as fast-fashion chains such as H&M, the bank said. Overall, however, store owners remain optimistic about the rest of 2019, according to the National Retail Federation, which represents businesses contributing $2.6 trillion a year to the U.S. economy. The group’s chief economist, Jack Kleinhenz, noted that original estimates for January sales were revised upward and that online merchants saw gains compared with both the previous month and February 2018. The jobless rate remained at 3.8 percent in February, near a 50-year low, and average hourly pay grew 3.4 percent to $27.66, according to the Bureau of Labor Statistics. For example, an aging baby boomer population has fueled employment in the health-care industry, while the post-crisis business sector has supported the addition of tens of thousands of jobs per month. 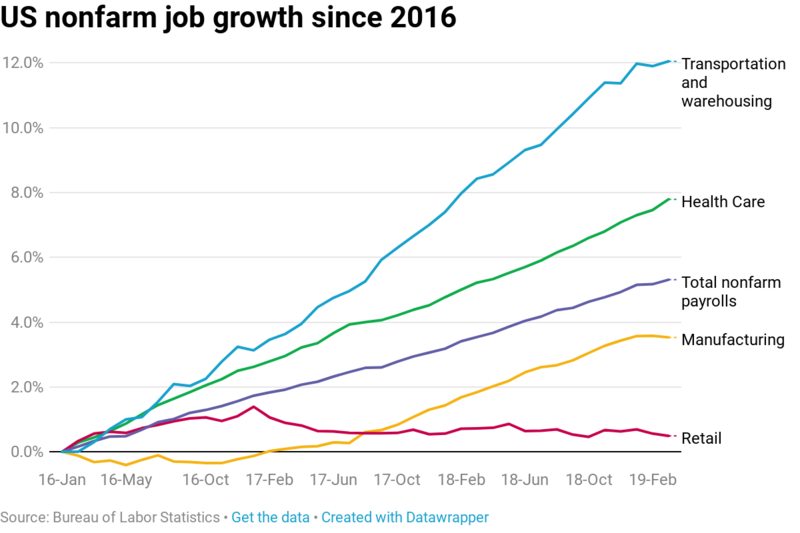 The government’s Friday report on the employment situation showed the health care sector alone added 61,000 jobs in March, while the business industry tacked on another 37,000. The lukewarm performance in the retail sector have come despite a broader economic groundswell, with Trump’s corporate tax cuts giving businesses a balance sheet boost, goosing GDP growth above the rate many economists feel is sustainable. A good chunk of the jobs created in November were in retail — likely to keep up with holiday sales — says the National Retail Federation. Employment in retail was up by 18,600 jobs in November, seasonally adjusted from October, said the Federation. That means that of 155,000 jobs created in the overall economy last month, nearly one in eight were in retail. 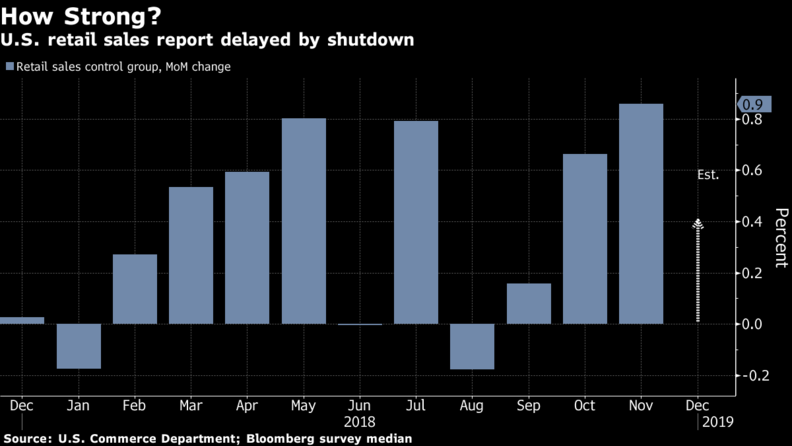 Calling the retail jobs numbers “satisfying,” the federation’s chief economist, Jack Kleinhenz, said in a statement that the boost came during and after the wildfires in California and bad weather in other areas of nation, all of which likely dragged on the sector. The numbers were a good sign, given the context of the overall economic and national picture, he said. “In retail, the tight labor market has created sizable challenges in hiring – there are actually more retail jobs available than there are people to fill them. Retailers would hire more workers if they could find them,” said Kleinhenz, in a statement. Still, compared to last year at the same time, unadjusted retail employment dipped by 16,300 jobs, said the group. And, the Department of Labor, in its job report, noted that “retail trade employment changed little” in November, noting that most of the jobs created were in health care, manufacturing, transportation and warehousing. The total employment numbers across all sectors released Friday by the Labor Department were considered a disappointment by many, as projections were for a bigger boost. The jobless rate for retail was 4.2 percent; the unemployment rate overall remained unchanged at 3.7 percent. Of the total positions in retail in November, most were at department stores, warehouse clubs and other general merchandise shops, while the rest were at a variety of merchants and in online sales. Many jobs were lost at sporting goods, hobby, electronics and appliances stores, according to the federation. The group predicts up to $721 billion in retail sales over this holiday season.